Plastic: once seen as an industrial miracle, but, now it’s only become our planet’s worst nightmare. One of the most dire issues we face as a planet is the plastic problem. All life on our planet is affected, whether we directly realize it or not. Plastic has only been mass-produced since the 1950’s and the consequences of this include, plastic pollution and major emissions of fossil fuels due to lack of green-energy sourcing. 99% of plastic products produced are from fossil-fuel based chemicals contributing to climate change. Less than 10% of the plastic used in the United States is recycled and globally only 18% of plastic is recycled. There are varying reasons for the lack of recycling in the world, but one major factor is the lack of working facilities and processes. So what does this all mean for life on Earth? The ocean and land are feeling the drastic effects of plastic pollution both on micro and macro scale. 1/3 of all plastic waste can end up in water or soil, directly impacting our farming, drinking water, and environment. According to National Geographic, nine million tons of plastic end up in the world’s oceans. In the oceans alone, 700 different species are harmed by plastic in some way. 86% of all sea turtles, 43% of all marine mammals such as whales or dolphins, and 44% of all seabirds have ingested plastic or microplastics. Microplastics are the pieces of broken down plastic that is less than 5 millimeters apart and they can break down into nanoparticles, making it easier for it to enter our soil and water. 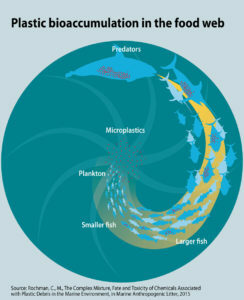 The plastic ingested by animals creates a domino effect by moving up the food chain in a disease-like way, creating bio accumulation. An example would be, if a bird eats a fish that has ingested plastic, the bird now has plastic in it’s system, and is more at risk for health issues. In one year, over one million sea birds have died due to plastic and 100,000 marine creatures perish due to plastic entanglement. Both marine and terrestrial animals are at risk to ingest too much plastic, which can lead to digestive issues and eventually starvation, because they won’t know they are hungry. There are many different organizations raising awareness for the plastic problem in the ocean, but we cannot forget about the terrestrial animals. Grazing animals such as, raccoons, squirrels, dogs, cats, etc. can all be trapped by plastic litter, whether that be soda can rings, plastic bags, or even a peanut butter jar! Habitats are also destroyed due to landfills and naturally occurring plants/animals are affected by the excess amount of waste. The bottom line is that every living being on this planet is at risk because of our excessive reliance on plastic. Choose us and our planet over plastic. There are a plethora of resources to help yourself and others use less plastic, visit http://www.plasticfreejuly.org/ for more tips and tricks on how to #choosetorefuse! Join us at Fleet Farming as we #choosetorefuse not only during plastic-free July, but every day! 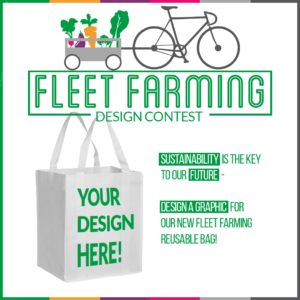 #Choosetorefuse by submitting a design for the Fleet Farming reusable bag contest on facebook! Submit a design by Friday, July 27 at 9pm and the winner will be announced on July 30 (Monday). The winning design creator will receive the bag with their design on it filled with Fleet Farming merchandise, including a t-shirt! There are a plethora of resources to help yourself and others use less plastic, visit http://www.plasticfreejuly.org/ for more tips and tricks on how to #choorsetorefuse!